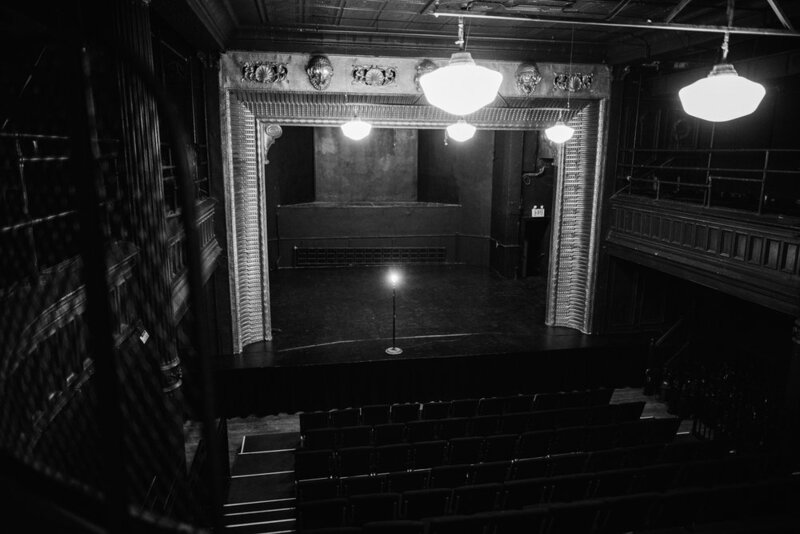 The Connelly Theater is one of New York City’s most unique and sought-after venues for off- and off-off-Broadway theater productions, featuring a classic raised proscenium stage and seating that can accommodate Showcase Code and Contract productions at 99 or up to 150-seat configurations. Rental includes light, sound, and soft good packages. The theater is air conditioned, and includes access to lobbies and spacious basement dressing room. We recommend that any company interested in renting contact us to arrange a tour. The Connelly is set up for rentals of one week or longer. For special events and film shoots, pending availability, we may be able to accommodate daily rentals. Before emailing us to inquire, please see our FAQ for more information on requirements for short-terms rentals. We recommend reaching out as early as possible in your planning process, however, please don’t hesitate to contact us for last-minute rentals, as we do occasionally have availability. If you’re interested in renting, please contact our General Manager, Josh Luxenberg at theater@connellycenter.org. Please include information about your proposed project so that we may provide you with a quote and appropriate information. Any part of our stock inventory that isn't being used by our current production may be available for rental, including lighting instruments, console, soft goods, speakers, etc. Take a look at the inventory list to the left, then send an email to theater@connellycenter.org to find out about availability and rates. The plans below are the most current as of March 7, 2019. We will be adding detail over the coming weeks, so please check back, or email the GM for the latest draft.